Naming a new plant isn't like naming a new person; the naming and classification are more like an ongoing process than a one-time event. 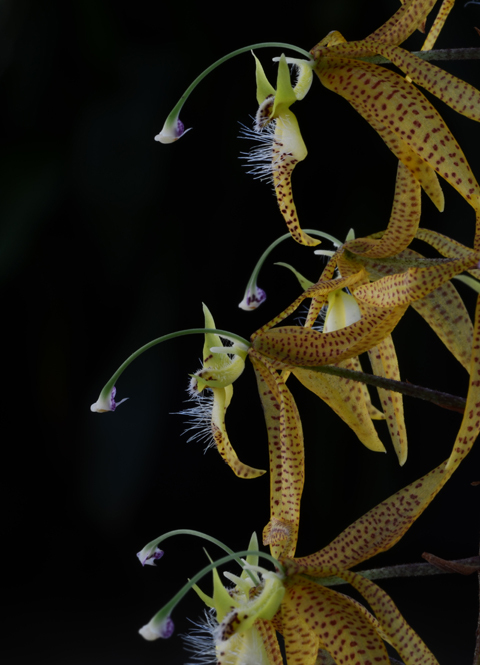 When John Lindley, the 19th century English botanist, described the orchid above with its long arching column, he put it in the genus Cycnoches (the Swan Orchids, from the Greek kyknos [swan] and anches [neck]). However this plant is different from the Swan Orchids in almost every other way. 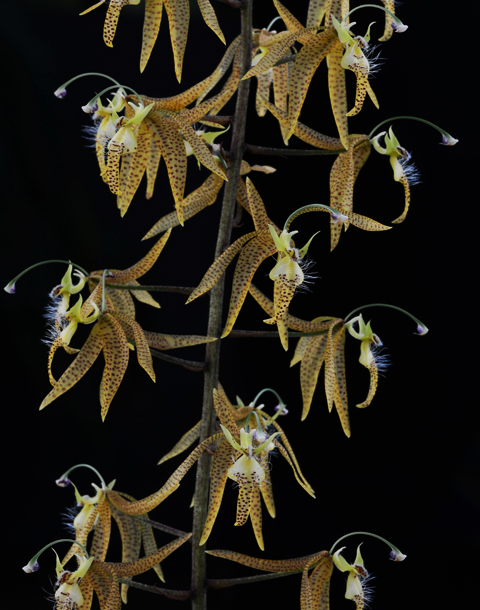 It has lots of small hermaphroditic flowers and ovoid pseudobulbs. Cycnoches has unisexual dimorphic flowers that are large and waxy, and tall spindle shaped pseudobulbs with many internodes. With more information in hand, H.G. Reichenbach in 1855 created a new genus for the plant and named it Polycycnis, from the Latin poly (many) and cycnis (swan). Many swans. Polycycnis is more closely related to Stanhopea than it is to Cycnoches. Like Stanhopea, it is pollinated by fragrance-collecting male Euglossine bees. The bee lands on the lip of the flower and crawls toward the center where he scratches in order to obtain the liquid fragrance. When he alights, he smacks into the end of the long arching column and receives a packet of pollen on his thorax. Polycycnis muscifera grows as an epiphyte below 2000 meters elevation in Costa Rica, Panama, Venezuela, Colombia, Ecuador, Peru and Bolivia.